No matter how many kitchen design ideas you have in mind, make sure that you will always stick to a specific color palette. This helps to ensure that the interior design is incorporated. It also helps to make these areas look effortlessly organized and attractive. Are you looking for something more contemporary or rustic? What are your plans for the rest of the home in time? What is your budget and what are your priorities? These are all questions we will discover upon your complementary inspection and estimate, and will help us both better understand the undertaking ahead. We would first consider the orientation of desire, and whether you would like to see a setting sun, or go to the south or southwest to avoid direct sun rays and keep the kitchen cooler throughout the year. If the space is available, we may also want to look at creating an entrance into the garage, so you can have an easy way of bringing in groceries. The space and flow from the cooking area and adjoining or adjacent dining room will be a crucial part of the entire kitchen design. This will determine the best layout of appliances and any potential kitchen island. 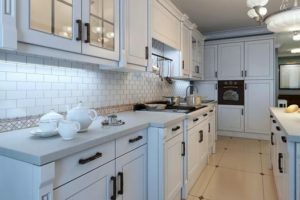 For countertops, we will provide you with as much counter space as you wish, and if you would like to expand your existing counters we can also accommodate. For the cabinets, we are very lucky to have access to the finest local cabinet manufacturers. 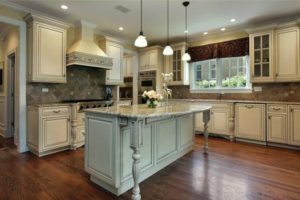 We have many options available for both standard and customized kitchen remodeling projects. Whether you wish to change or update your cabinet layout, or use an existing layout, we will make sure they have a flush fitting to the space available. Many of our Wilmington clients choose a new countertop material when selecting new cabinets. Having new material for both the kitchen cabinets and counters will provide a needed makeover without having to seriously overhaul anything. A mud room is another great idea for families, or those who entertain and have family members or guests coming in from the snow or rain and track it throughout the house. When having the mud room next to the kitchen, there is an embedded buffer from the outside elements and the rest of your home. The kitchen dining area may also require specialty or handicap accessibility options, which we can also provide our expertise and experience to find a customized solution. We can create wheelchair access, and more space around the kitchen and dining area where anyone can maneuver comfortably. All of our designs will have inspiration from your own personality, and we make sure you can see the same vision before the work begins. Perhaps the primary focus of the new kitchen design, the “work triangle” is a top priority in designing access and layout. The triangle is formed by the refrigerator, main sink, and range (stove). When cooking, there must not be anything interrupting the flow to these three areas. Therefore the ideas must take shape around these three key features, and optimize the flow for the cook while also allowing for others to pass through. There are many new refrigerators on the market today, some with a classic design and others that are so advanced that they pair with your smartphone and have a color television in them! We will help find the match that best suits your tastes, budget and overall new kitchen scheme. The stove and dishwasher will most likely match the refrigerator, in terms of the look and technological capability. This should help ease the transition into the use of new appliances. The sink and faucets are an opportunity for personal expression, as there are hundreds of styles available for all personalities and design aspirations. We can fit your sink with a rustic, new-aged or contemporary faucet fixture, with various water flow possibilities as well. There may be a way for us to install another, separate sink, that could be used for dishes exclusively, or however you see fit.